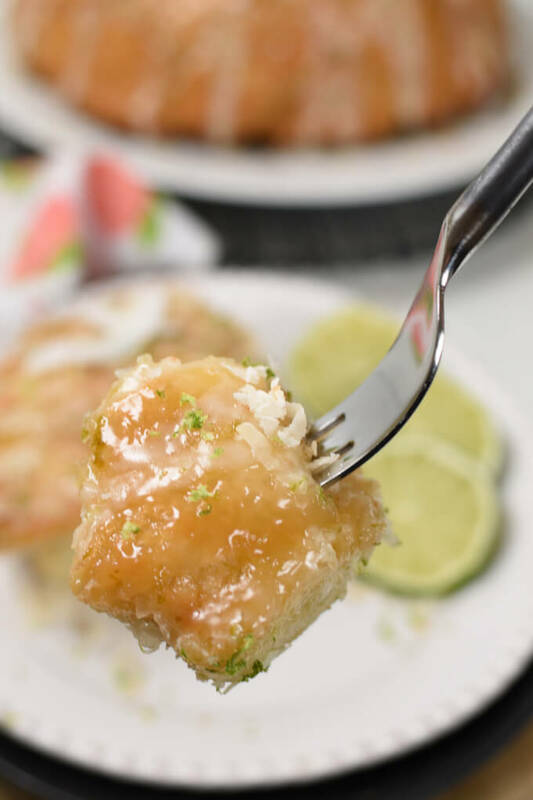 You MUST try Coconut Lime Monkey Bread! 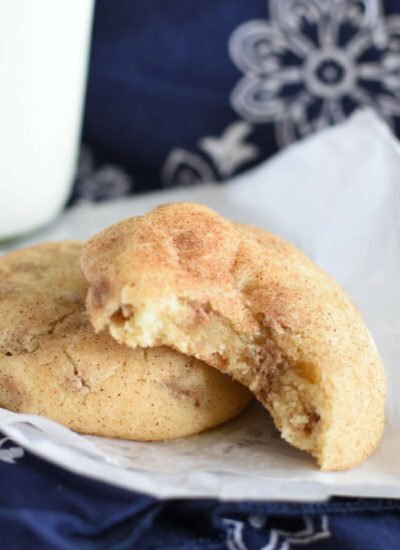 It’s sweet, a bit tangy, gooey on the inside, and a golden brown and crispy on the outside! There’s more though, it has the most incredible lime glaze that really is like icing on the cake! You can make it and bake right away, or stick it in the fridge overnight and bake in the morning. 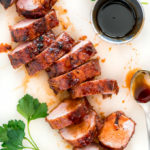 Want more delicious recipes? Sign up for my email subsription and I’ll send them right to your inbox! You guys! 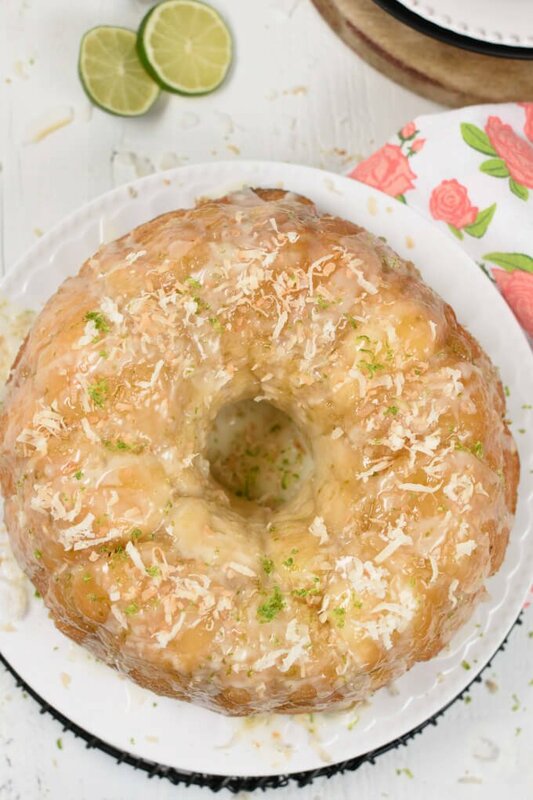 I don’t mean to sound bossy, but you really have to make Coconut Lime Monkey Bread ASAP! I’ve made many, many varieties of monkey bread and this one, I really think it’s my favorite so far! 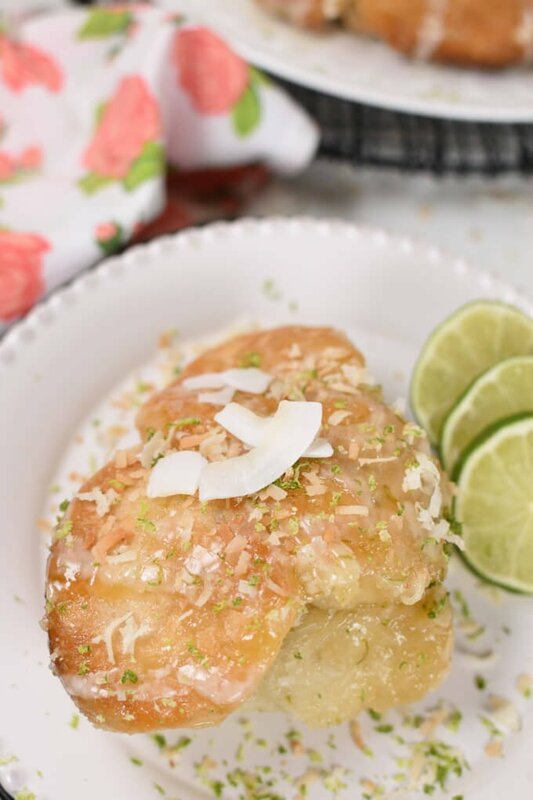 Coconut lime is a winning flavor combination anyway and it’s stellar in this bread! It makes me feel like spring might actually be around the corner! In fact, my kids are on spring break this week, and that means I’m really hurrying to get this post written so I can get back to bossing them around while they clean the garage. So please ignore all the spelling errors, etc. 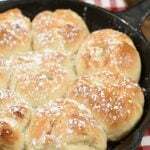 Rhodes rolls make the best monkey bread. My kids kids feel pretty proud of themselves because they know how to pop open one of those cans of biscuits and make bicuits and gravy all by themselves. So I guess what I’m saying is those cans of bisuits have their place. Please, please not in monkey bread though! Using Rhodes frozen dinner rolls is the best way to enjoy “homemade” tasting monkey bread without having to spend all day proofing dough. I realize you’re going to plan a little extra time for the dough to rise. It’s so worth it! Promise! 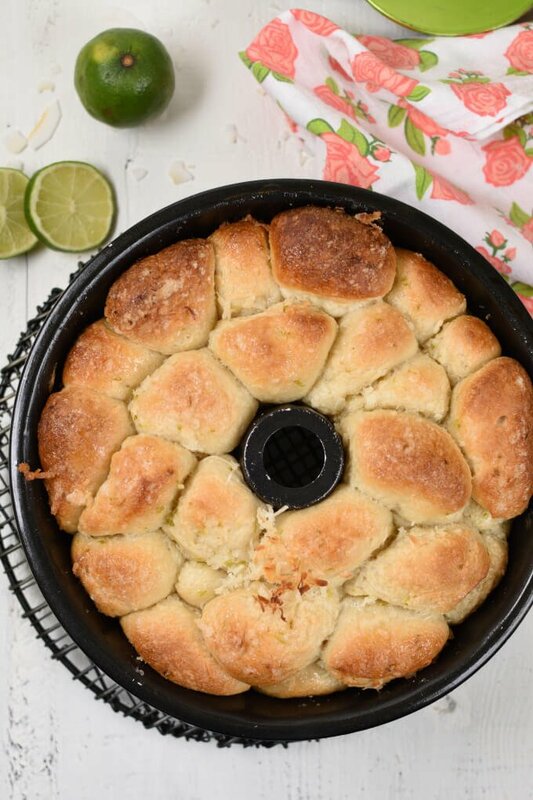 You’ll never want to go back to those canned biscuits, at least not for monkey bread! Let the rolls thaw only long enough so they are soft enough to cut with a pair of scissors. Either cut in quarters or in half. How to make monkey bread without a pudding mix! I know, I know! I’m usually all about shortcuts like tearing open a package of pudding mix and calling it done. There’s a tiny bit more to this monkey bread. Don’t let that scare you off, it’s still so easy! 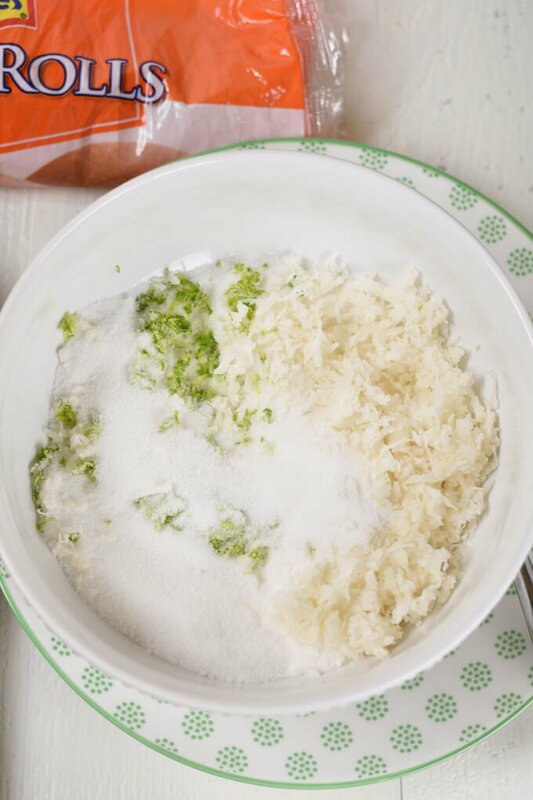 Mix sugar, shredded coconut, and lime zest to a bowl. Melt butter. Dip pieces of bread in butter. Then roll them in the sugar mixture. My 11 year old helped me and let’s just say there was sugar and butter everywhere! Can I let monkey bread sit overnight? Yes! If you’d like to bake the monkey bread in the morning cover it with greased plastic wrap and stick it in the fridge. It will rise overnight while it’s in the refrigerator. I always put it in the fridge right before I go to bed. Remove it from the refrigerator about 15 minutes before baking while oven preheats. The rolls should be doubled in size. If you’d like to bake the monkey bread the same day you make it cover it with greased plastic wrap. Then let it rest at room temperature until doubled in size. Time will vary depending on room temperature, usually about 3 hours. How do I keep monkey bread from getting too brown? Monkey bread made in a bundt pan is pretty thick. It’s easy to overbrown the tops, yet have an underbaked center. About ten minutes before the the baking time is up, if the bread is gettig too brown cover with aluminum foil. This will slow down the browning process and allow the center to bake through. 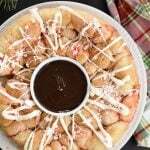 How do I remove monkey bread from a bundt pan onto a serving platter? It’s always a bit like the moment of truth we’ve all been waiting for! You know you cross your fingers and hope it releases! Let the bread set in the pan for about 5 minutes after removing it from the oven. Choose a plate that’s a little bigger in diameter than the bundt pan. Invert the serving plate, or platter, and set it on top of the bundt pan. The top of the plate and the top of the bundt pan should be touching each other now. Using oven mits, or hot pads, hold onto opposite sides of the pan/plate and flip it over. It will most likely slide right out. If not, gently wiggle it. If the bread still won’t release, you may have to set the bundt pan down, run a knife, or spatula around the edges of the pan to help release the bread. Then repeat the process. 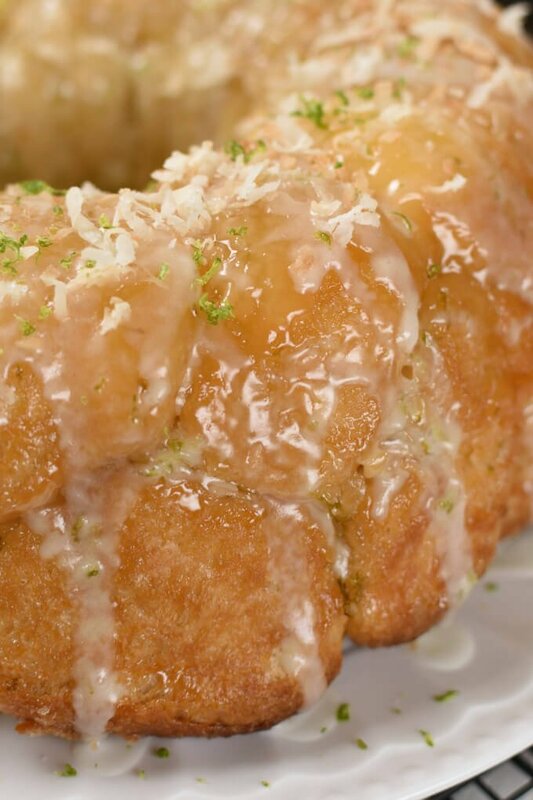 Coconut lime glaze really is like icing on the cake! Do I need to glaze my monkey bread? Nope! You don’t need to. 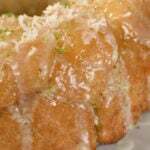 However, I strongly suggest for Coconut Lime Monkey Bread! 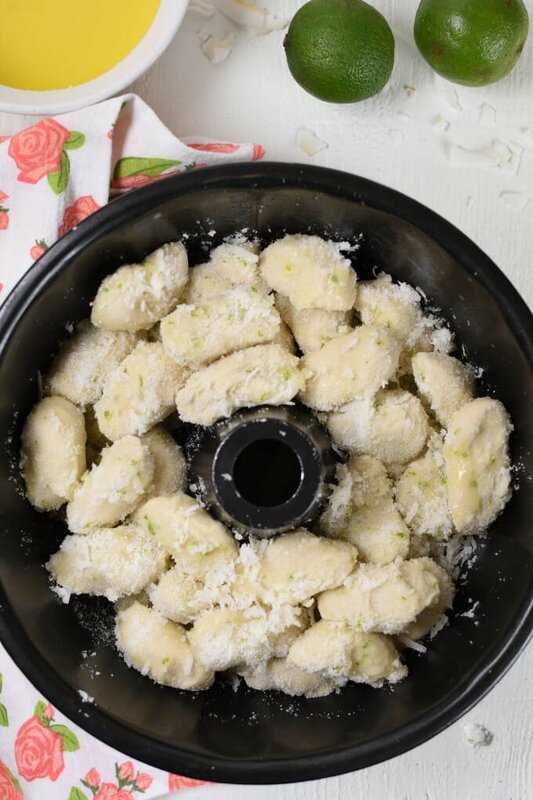 This glaze is made with powdered sugar, lime juice and zest, butter, and coconut extract. I could drink it with a straw! Drizzle it all over the bread while it’s still warm and it will settle in all the little cracks! It’s so stinking good! 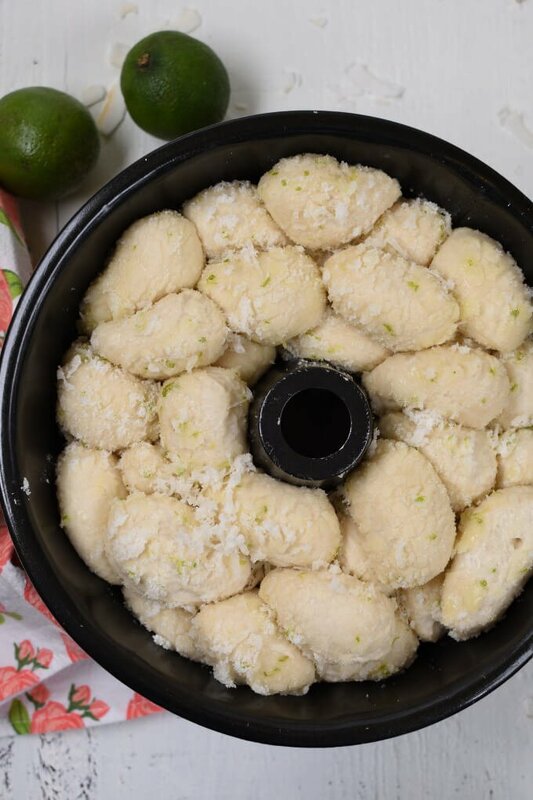 Garnishing the bread with toasted coconut and extra lime zest makes it extra gorgeous! This breakfast recipe is easy enough for weekdays and fancy enough for holidays! 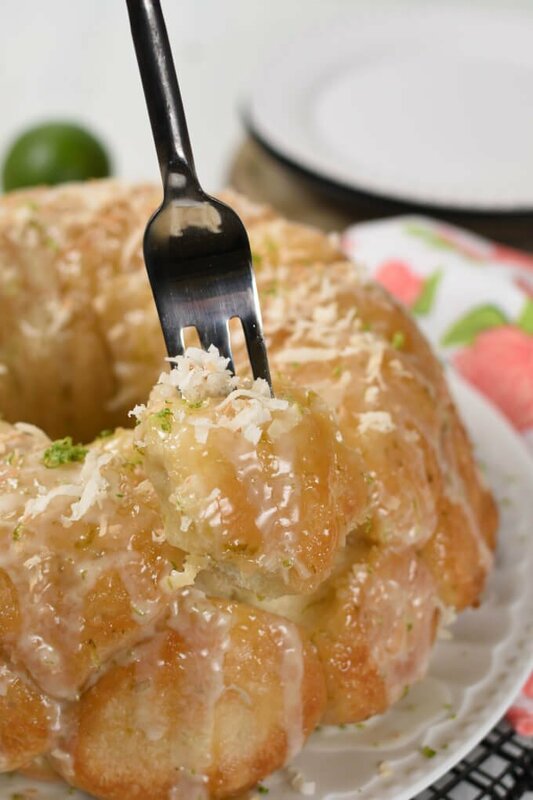 Coconut Lime Monkey Bread is screams spring and summer to me! I think it would be the perfect addition to Easter brunch. It would also be fantastic for Mother’s Day. Especially since I’m confident it’s easy enough even the most amateur dads and kids can successfully make it! 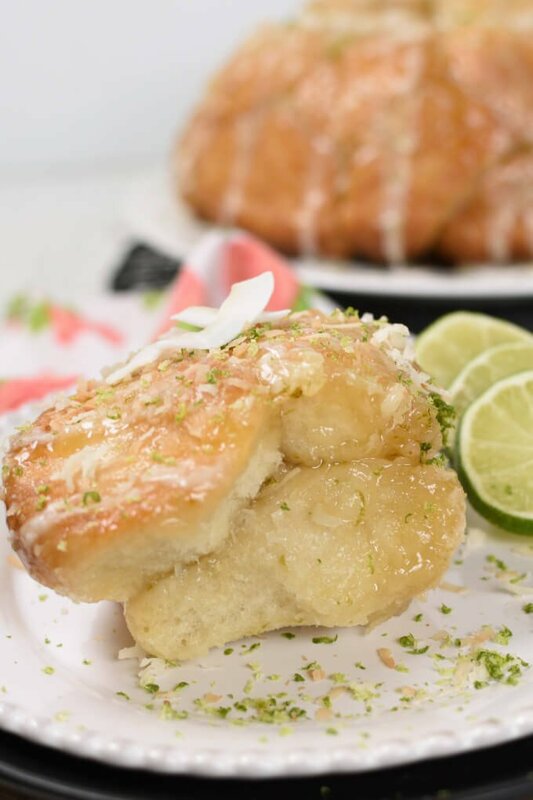 Grab my Coconut Lime Monkey Bread Recipe! Thaw Rhodes rolls only until they are soft enough to cut with scissors. Grease a bundt ban with baking spray. While rolls are thawing prepare lime sugar. 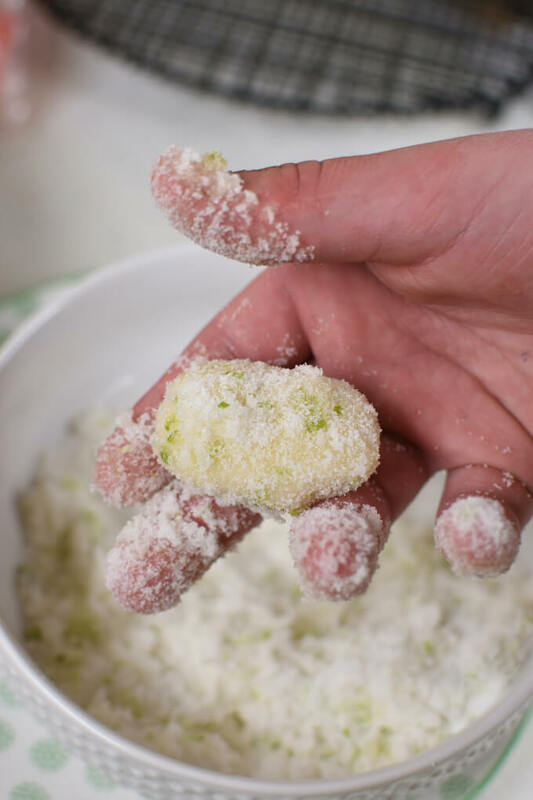 Add sugar, lime zest, and shredded coconut to a shallow dish. Mix to combine. Set aside. Melt butter in a shallow dish. Cut rolls in quarters or in half, depending on how small you want each piece of bread to be. 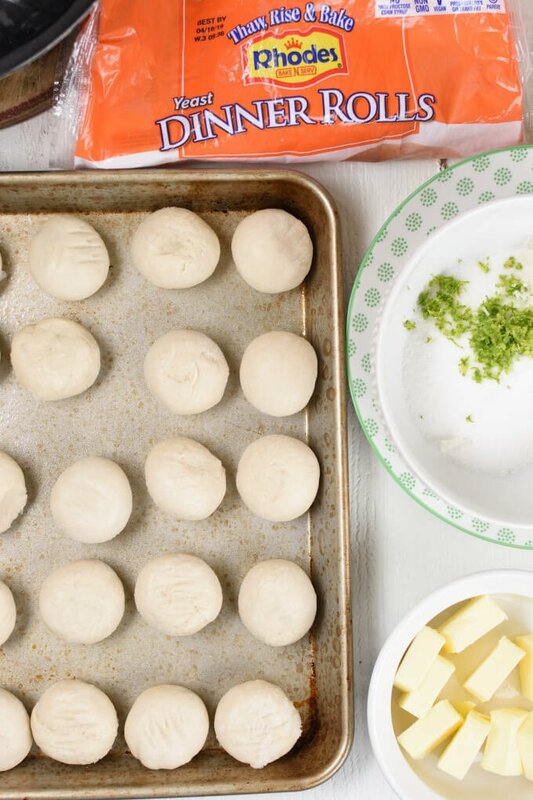 Dip each piece of roll in melted butter, then roll in sugar mixture. Place evenly in bundt pan, making sure seams don’t line up. If you have extra butter set it aside until rolls have risen. Cover with greased plastic wrap and let sit at room temperature until doubled in size. Time will vary depending on temperature of the room. Typically around 3-4 hours. Once rolls have risen, remelt remaining butter from the “dipping” process and drizzle it over monkey bread. Bake at 350 degrees for 30-35 minutes. Check after the first 20 minutes of baking. If rolls are overbrowning they can be covered with aluminum foil for the remainder of baking time. Let baked monkey bread sit in the bundt pan to cool for 5 minutes. Invert on a serving plate, or platter. Cool for about 5 more minutes. Drizzle with glaze. If desired garnish with additional toasted coconut and lime zest. 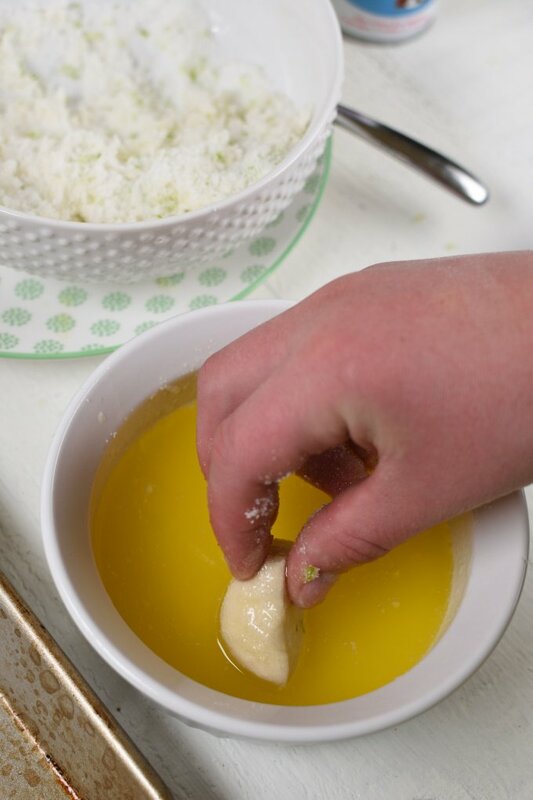 Make glaze while you are waiting for baked monkey bread to rest. Whisk all glaze ingredients, except milk together. Glaze tends to have a mind of it’s own. If it’s too thick add a little milk. If it’s too thin, add a little more powedered sugar. 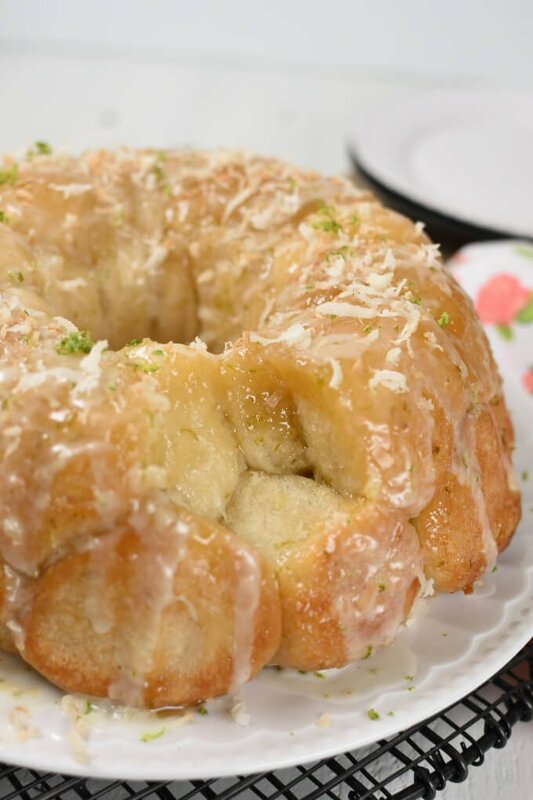 Coconut Lime Monkey Bread can be made the night before serving. Assemble the monkey bread until it’s layered in the bundt pan. Then cover with greased plastic wrap. Refrigerate overnight, or until doubled. In the morning remove from the refrigerator and let set at room temperature while oven preheats. For added coconut flavor, 1 tsp. coconut extract can be added to the melted butter. You may also layer half of the pieces of monkey bread in the bundt pan, then sprinkle with additional shredded coconut. Then layer remaining half of monkey bread. 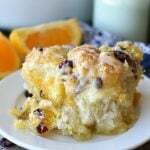 I love a great recipe for monkey bread, and this is no exception! My kids love it when I make this for them. They will be excited to try this out! Yes! They will love it! My eleven year old really enjoyed helping me make it too! I’ll admit it almost takes more patience than I have to let him help, but I love spending the time together! The coconut and lime combo sounds amazing! Excited to give this a try!! Thanks! 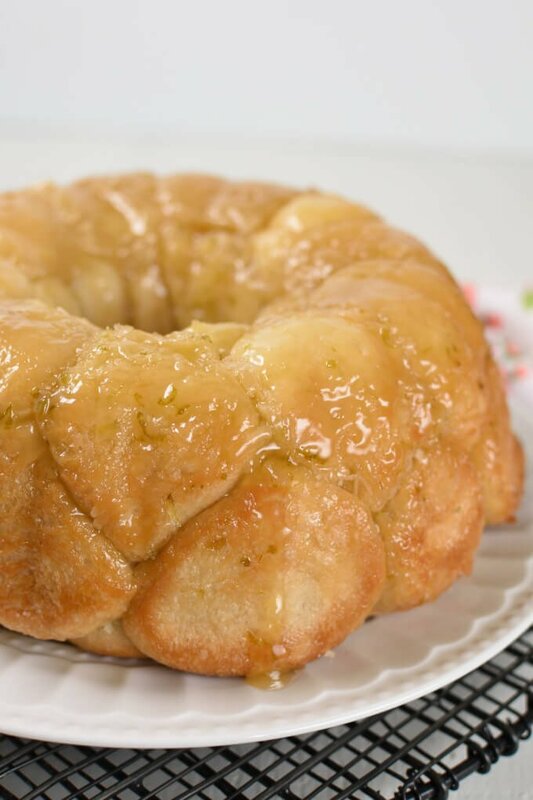 We’re loving this flavor combo in about everything, and it is every bit as amazing in this monkey bread! Can’t wait for you to try it! Oh my, I love how easy this is!! And the flavors are incredible!! YUM!! 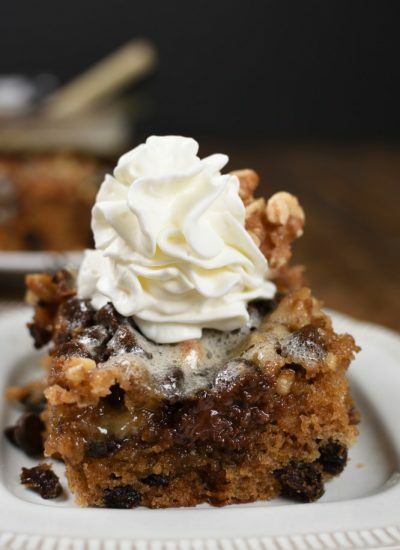 Be prepared to eat it all in one setting, because it’s pretty much irresistible! Enjoy! Coconut and lime are so good together! I am drooling over this! Aren’t they heavenly? 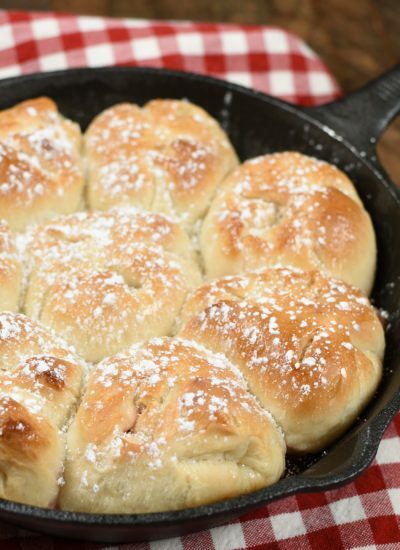 They are so perfect for spring and they are spot on in this bread! Let me know what you think of it! Looks heavenly! I can me this at home now, absolutely a perfect addition on the table! Thank you! 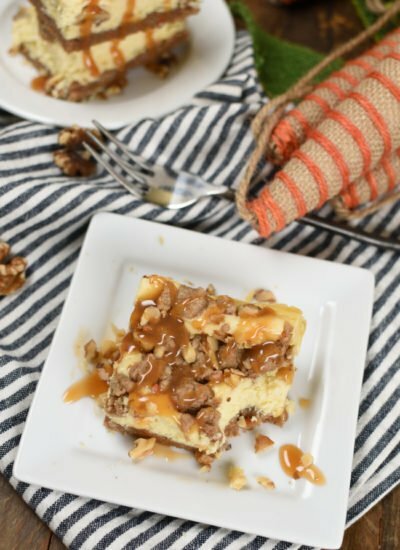 It’s one of those recipes that will be showing up over and over again! That lime flavoring in there sounds so good! I cannot wait to make it! Yes! I love the lime flavoring! It makes me feel like spring is right around the corner even if I still have snow drifts in my yard! I can’t wait for you to enjoy it! This looks delicious! This is seriously making me hungry! Oh my goodness! It would definitely satisfy your hunger! It’s one of the BEST breakfast recipes!